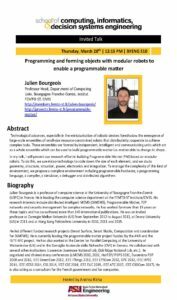 Please join Julien Bourgeois, University of Bourgogne Franche-Comté (UBFC), France, for the seminar, “Programming and forming objects with modular robots to enable a programmable matter,” on Thursday, March 28, 2019! Technological advances, especially in the miniaturization of robotic devices foreshadow the emergence of large -scale ensembles of small-size resource-constrained robots that distributivity cooperate to achieve complex tasks. These ensembles are formed by independent, intelligent and communicating units which act as a whole ensemble which can be used to build programmable matter i.e. matter able to change its shape. Julien Bourgeois is a professor of computer science at the University of Bourgogne Franche-Comté (UBFC) in France. He is leading the computer science department at the FEMTO-ST institute/CNRS. 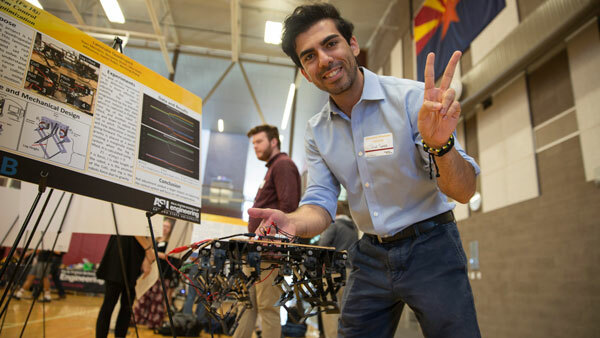 His research interests include distributed intelligent MEMS (DiMEMS), programmable matter, P2P networks and security management for complex networks. He has worked for more than 15 years on these topics and has co-authored more than 140 international publications. He was an invited professor at Carnegie Mellon University (US) from September 2012 to August 2013, at Emory University (US) in 2011 and at Hong Kong Polytechnic University in 2010, 2011 and 2015.